Image of the book’s cover. The book is bound in a paper case. Title page. The window layout is a nod to title page on Robert Burton’s Anatomy of Melancholy. 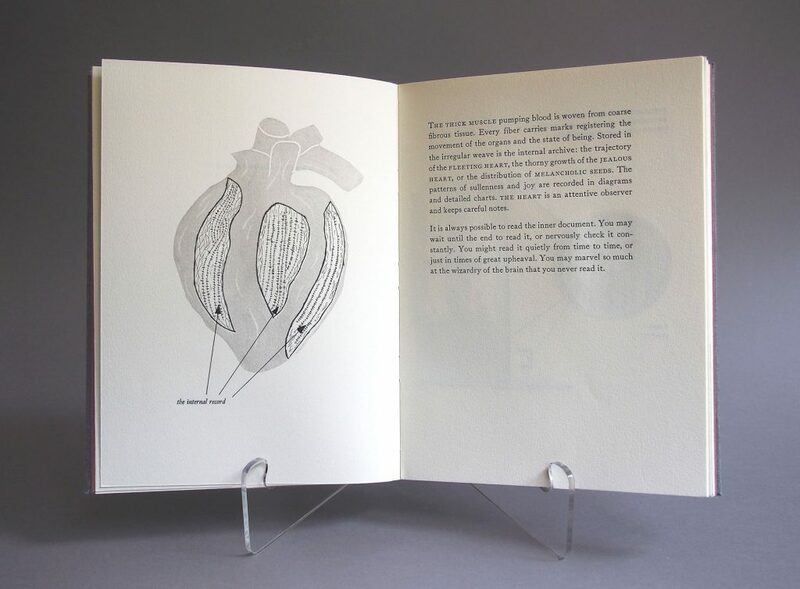 An explanatory text and diagram about the heart. The heart keeps record of emotional life. The records are woven into its fiber. One of five folios explaining a biomythology about emotional life. In this case melancholy is a seed cast out by the mind that falls down into the body and weighs down the heart. 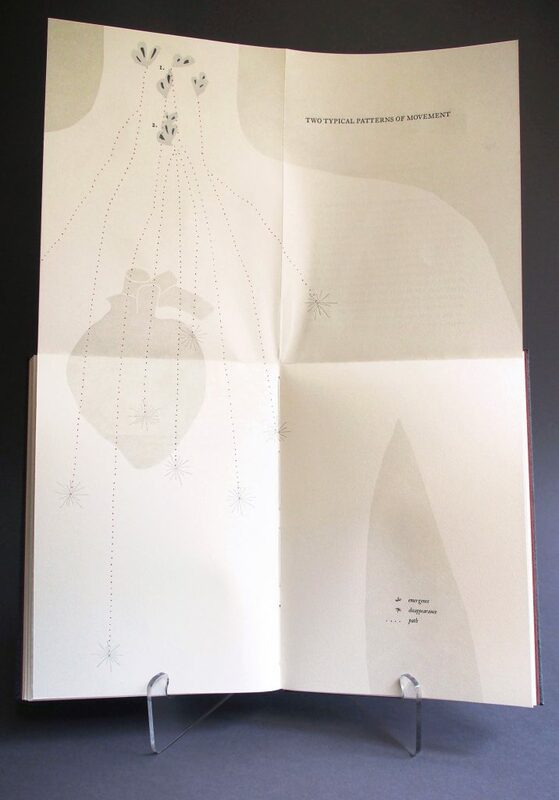 Folio includes text, enlarged image of melancholy seeds and diagram of the range of feeling possible when melancholy. 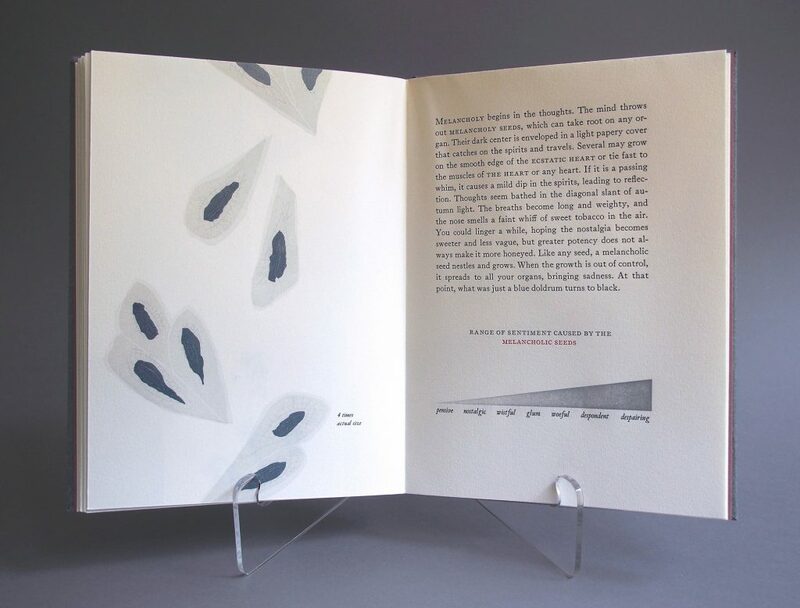 The folio opens out into a fourfold showing the melancholy seeds in a life size body. It is an anatomical chart. 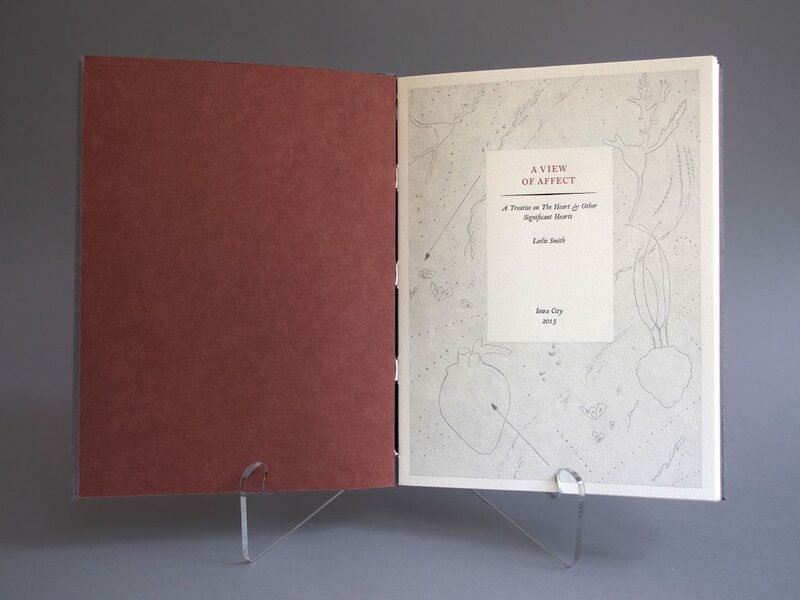 Leslie Smith makes drawings, prints, and books based on her interest in early modern science and translation. She holds an MFA in Book Arts from the University of Iowa Center for the Book, and a master’s degree in Library Science. She currently lives in North Carolina where she teaches at the Sawtooth School for Visual Art and is developing a project, exploring renaissance ideas on wonder and curiosity. 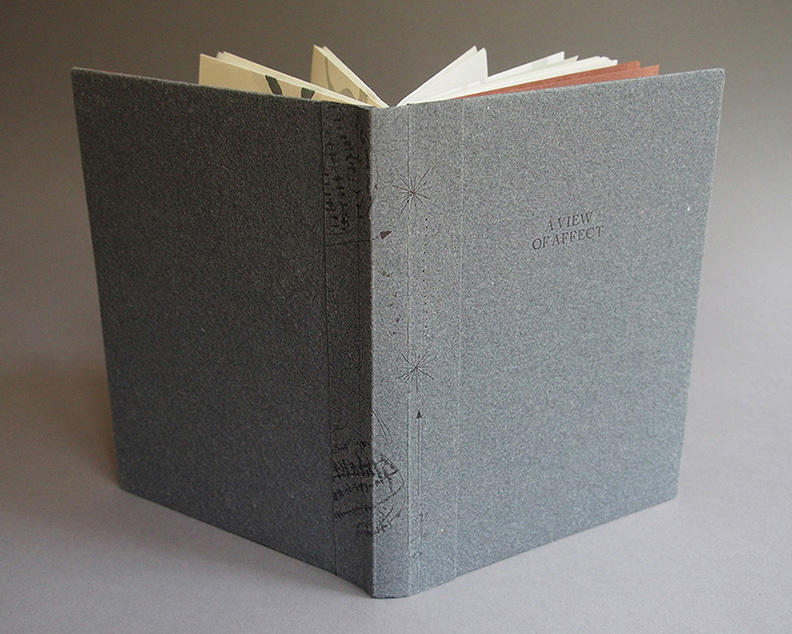 Letterpress, papermaking, and bookbinding are processes essential to my work. They enable the mixing of materials with text and image. I use my tools including; writing, drawing, printing, and papermaking to ask and answer questions. For me, writing leads to imagery and imagery leads to writing. Making and materials feed this productive cycle. For the last four years, I have been interested in the body and the mind. Curiosity has pushed me toward speculative questions. For example, what if emotions had a physical form? What would they look like? What if melancholy had a size, a shape, a color? These questions entice me to answer. I think melancholy would be harmless looking. It would be a pale blue seed that appears in the mind and then drifts softly down into the body. I create a response with text, drawings and diagrams. Currently, I am asking questions about the mind. Where are my memories? What is the pathway to a new thought? Responding to these questions is beyond tempting. By imagining an answer, I make new ways to think about and explain the human experience.